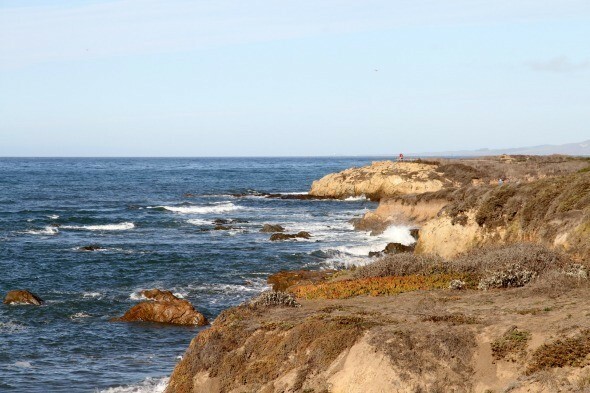 Let’s shine the spotlight on the Central Coast of California, specifically the charming and historic town of Cambria, nearby Moonstone Beach and the Paso Robles Wine Country. In my previous posts, I have shown you the tranquil inn where we stayed our first night, an artisan olive oil company, and an estate winery that also grows almonds and walnuts. After our busy day tasting and learning about wines and olive oils, we checked into another property owned by Cambria Inns for our second night. 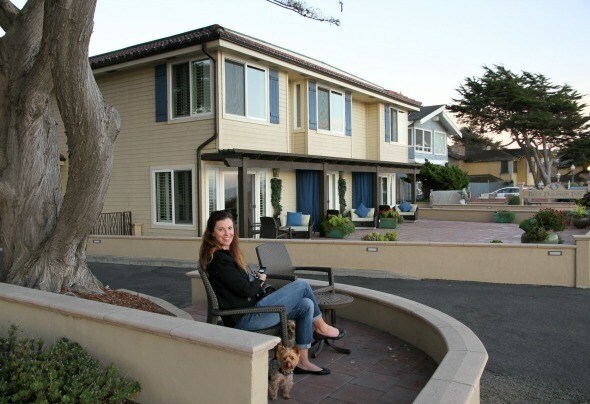 Blue Dolphin Inn is located just a short distance from Sand Pebbles Inn where we stayed the first night. 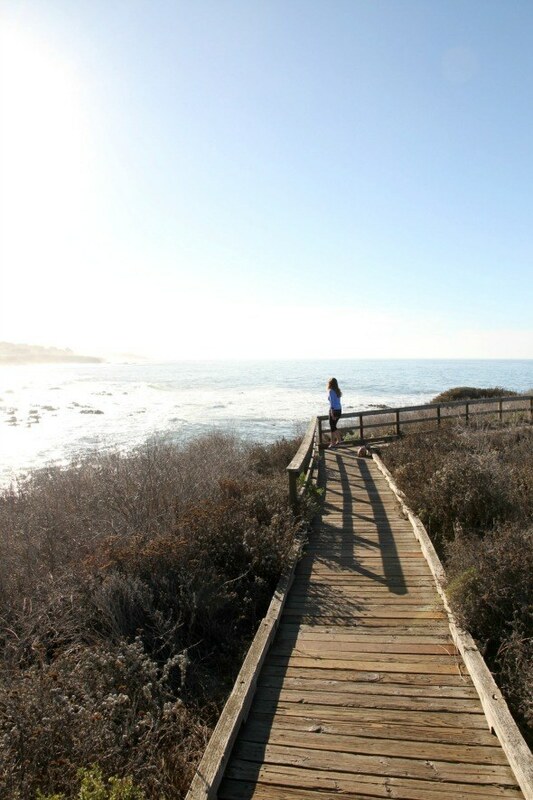 Both are right on the 2-mile Moonstone Beach strand and boast spectacular views of this rugged section of the Pacific Ocean. 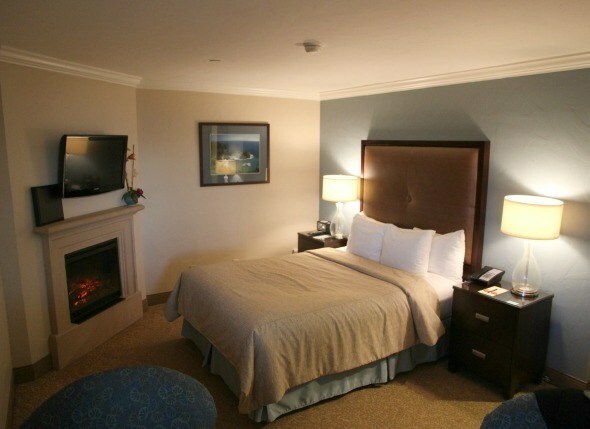 Recently updated with a major remodel, this upscale inn offers both comfort and luxury. Local designer, Lisa Marlow created a peaceful and inviting décor, sure to impress any guest. 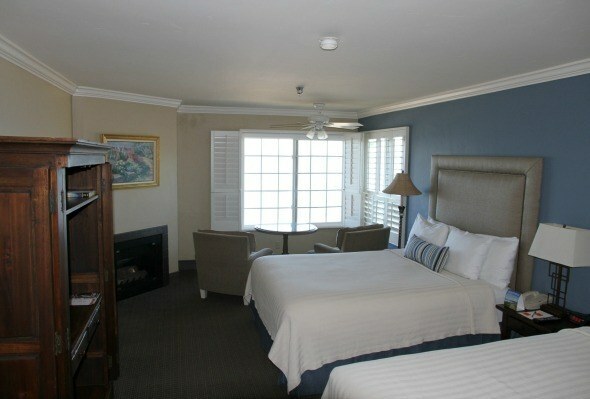 Six of the twenty rooms on the property are specialty rooms and are named after bodies of water from around the globe. Each room has its own custom décor and a breathtaking ocean view. 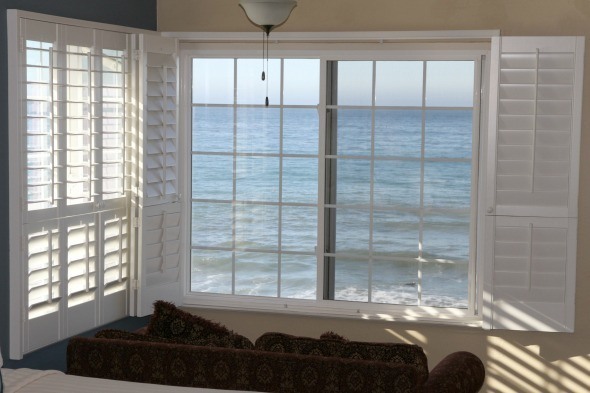 For guests who want to unwind by watching the waves roll in, the birds fly by and the sun make its way across the sky, a loveseat positioned ideally at a large window of this ocean view guestroom is perfect. Our room on the first floor had a partial ocean view. Cozy but still with plenty of space, this room was quiet and luxurious. The fireplace was a lovely and romantic touch. 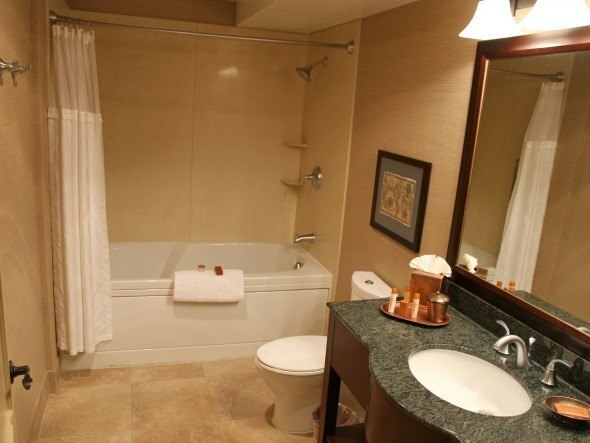 The bathroom was modern with beautiful accents and a luxurious tub. We were hungry after all of our sightseeing but we didn’t want to drive anywhere. 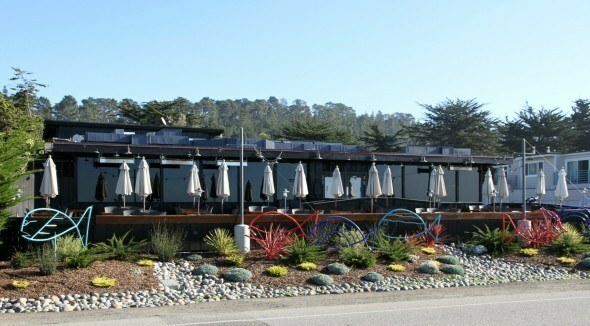 We opted to grab a bite at Moonstone Beach Bar and Grill which is just steps from Blue Dolphin Inn. The food is fresh and flavorful. 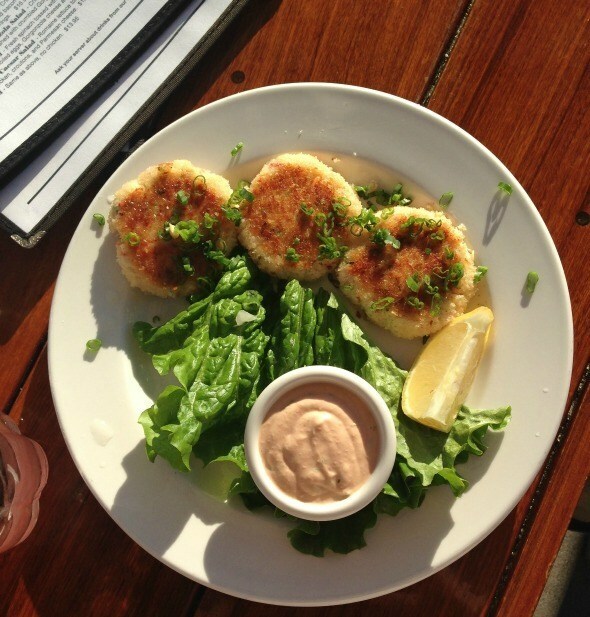 I loved my crab cakes made with lots of crab instead of lots of breadcrumbs like some places. 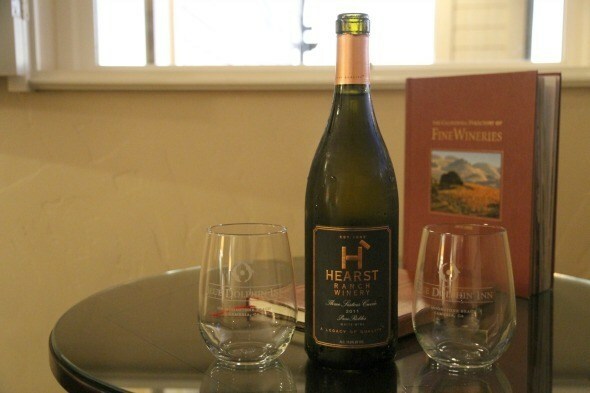 After dinner, we returned to our room to enjoy a bottle of local wine from Hearst Ranch Winery. 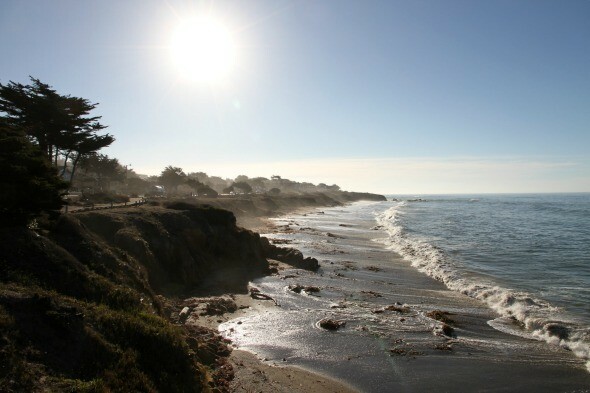 Did you know that Hearst Castle is just a short drive from Cambria and Moonstone Beach? We skipped going on a tour this time because we were exploring other parts of the area, but if you plan a trip to Cambria and haven’t yet been to Hearst Castle make it one of your highest priorities. It is an unforgettable experience. 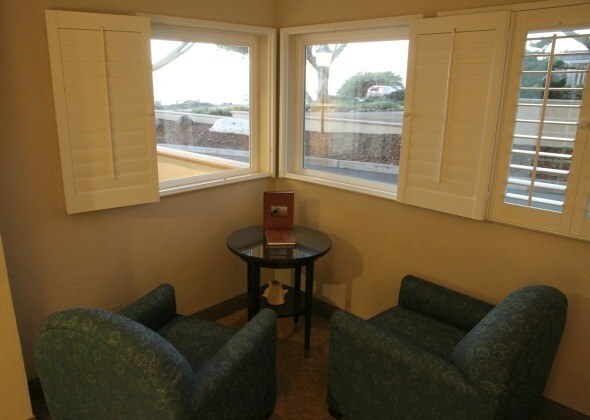 We sipped our Chardonnay in two cozy chairs situated near the windows of our room. 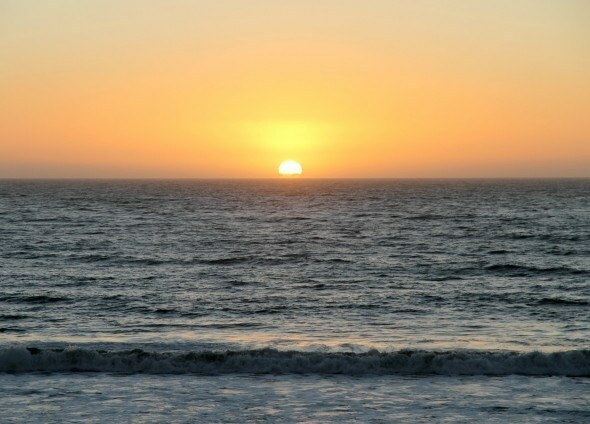 And watched the sunset while reviewing the highlights of our trip, a little sad that we’d be heading home the next day. The next morning, before we got on the road, we sat out on the small patio at a table for two in front of the inn. We brought our dogs along to get some fresh air and watch the sea birds with us. Pets are welcome at Blue Dolphin for a small fee. After a complimentary breakfast at the inn, we took the dogs for a walk down on the boardwalk and enjoyed the spectacular ocean views one last time before leaving. 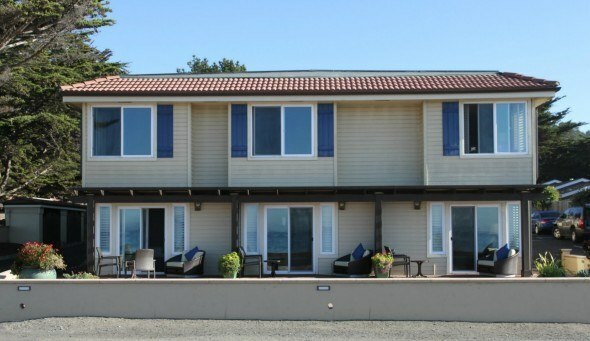 The beach, the sunshine, the wide-open ocean views and the rugged beauty of the Moonstone Beach make the ideal setting for Blue Dolphin Inn. It’s luxury combined with nature’s beauty in carefully designed comfort.